It's begun. The April A to Z has kicked off and I will begin our gamebook journey with amateur writers. Why do amateur gamebook writers make gamebooks great? They keep the fandom entertained when there is a dearth of official books. It is also great to be an amateur writer for many reasons - you can hone your writing/gaming skills, you can get great feedback about your book and you can go through the pleasurable process of creating something. On great website that showcases amateur gamebooks is www.ffproject.com. This website not only has gamebooks in doc and pdf form but you can also play a lot of those gamebooks online. I put some questions up on the guestbook of ffproject and some of the authors were kind enough to give me answers. Phil Sadler has created two brilliant full length Fighting Fantasy books- Hellfire and Riders of the Storm. He is also kind enough to share with us his inspirations and thought process. Something easy like Forest of Doom or perhaps something 'forgiving' like Legend of Zagor. You can change the course of the story; you can be the hero. Deathtrap Dugeon, House of Hell and Temple of Terror, but also many others such as Way of the Tiger and Lone Wolf. The instant death rule of mine is from Lone Wolf. The deadlock rule i'm not sure about, maybe I've forgotten. Keep throwing interesting decisions at the player: real choices that actually mean something. What inspired you to write an amateur gamebook? What has writing a gamebook taught you? It's easy to make things too difficult. The future of gamebooks may well be Destiny Quest. I vaguely remember reading a gamebook (much simpler version I imagine) when I was about 12, as an indecisive person I always found these quite difficult, and constantly wanted to cheat. Glad to see a recommendation for beginners to the genre and am gonna check it out. Thanks, great post. Many thanks for the comment Kate - I'm glad that you will check them out as I think that many people are in the same boat as you - they read gamebooks once but never got that into them. These posts are here so that people can find out just how extensive and great gamebooks are. Thanks for the post. I had never before hear do Deathtrap Dungeon but now I will be giving it a look see. 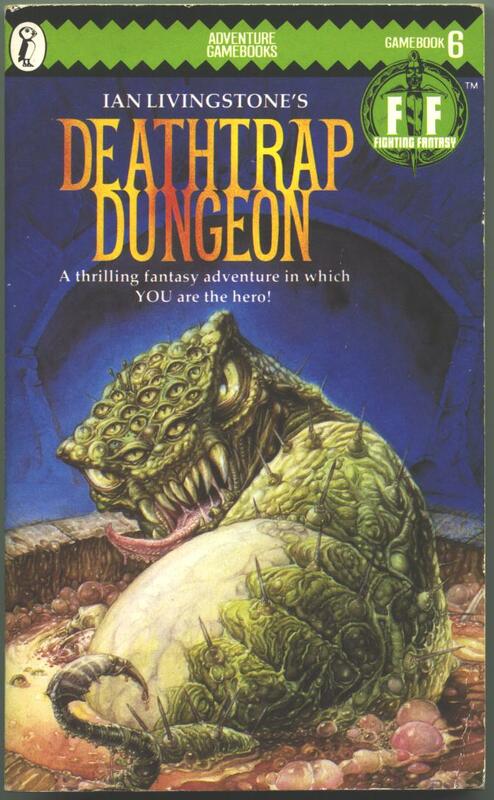 @MAJK Deathtrap Dungeon is certainly a great gamebook to start with - it's delightfully diabolical - expect to die a lot of times. Good luck with the A-Z! After the a-z you could consider more tips for write gamebooks. I really loved the last year tutorials. I certainly will be having more gamebook writing tips. I'll be collating all of the tips from the April A to Z to start with. Hello :) I found you in the A - Z list. I haven't read a gamebook before but this was interesting to me anyways! Hi Nikki, thanks for yout comment. I'm glad that you found my post interesting. Phillip, you are spot on with your comment about it being easy to make things too difficult. I was guilty of that in my teen writing years, usually via difficult die rolls/combat etc. On the flip side, however, I believe if one can make a gamebook incredibly difficult to complete by hiding the true path very, very, well (e.g. Creature of Havoc), and not because of die rolls, I consider that a gamebook masterpiece, from the gamebook mechanics point of view. I would be interested to know if anybody has achieved that at the same level Steve Jackson did with CoH.